#stampinup #paperpumpkin The colors in the October 2015 Paper Pumpkin kit are awesome! The genius designers at Stampin' Up paired Watermelon Wonder with Delightful Dijon and Old Olive--colors that are perfect for any season of the year! And the "Blissful Bouquet" stamp set is versatile, as evidenced by all the alternate projects I scanned through on Pinterest. In fact, I got several project ideas on Pinterest that I'm sharing today. But first, watch the video to see the cute projects that can be made by following the simple instructions on the video or on the instruction sheet included in the kit. For the 3" x 3" card, I cut a 2-7/8" square of Old Olive card stock. I stamped petals onto a piece of the pre-printed watercolored panel in Basic Gray. I cut this down to 2-5/8" square and adhered it to the Old Olive panel. I wrapped some more Very Vanilla Baker's twine around the card and added the "thinking of you" label. I used the Crumb Cake note card to make another "thinking of you" card. I stamped the sentiment directly onto the Crumb Cake note card in Basic Gray. I stamped the flower onto the same watercolored panel that I used for the 3" x 3" card and fussy cut it. I cut a square of Watermelon Wonder cardstock from my own stash and added a square of the preprinted foliage piece. As with the other cards, I wrapped a length of Very Vanilla Baker's twine around the front panel of the card and tied it in a simple bow. I added the fussy cut flower with the Stampin' Dimensionals included in the kit. I finished the card by added a gold foil floral element, also included in the kit. #stampinup I have time to share one last Halloween card before moving onto Fall, Thanksgiving, and Christmas. I'm really loving the Happy Haunting Designer Series Paper, so this week's Global Design Challenge was a great chance to use some more of it! The Global Design Challenge is new--this is only the 8th challenge. I'm always happy to find new challenge blogs for inspiration. 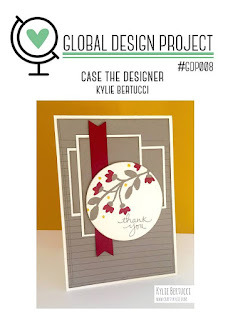 The GDP design crew are some of the finest stampers in the WORLD! Check them out! GDP Challenge #8 is to CASE a card. Normally, CASE means "copy and share everything," but for this challenge, CASE means "copy and selectively edit." In other words, use something about the elements of the card to inspire your card. I choose to use a modification of the layout so I could showcase the Happy Haunting DSP. 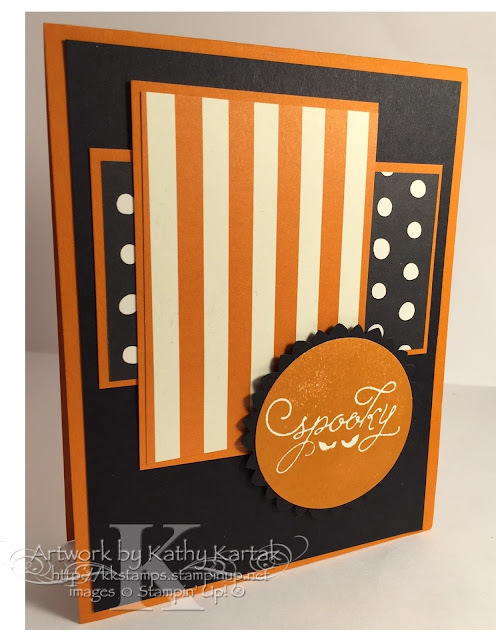 I started with a Tangelo Twist card base and added a Basic Black mat--you can't get any more Halloweeny than that! I cut two different sheets of Happy Haunting DSP--one is 2-1/4" x 3-1/2" and the other is 2" by 3-1/2". I backed each of these with a slightly larger Tangelo Twist mat. I adhered these pieces directly to the card. Next, I stamped the "spooky" circle from the "Among the Branches" set in Tangelo Twist onto a Very Vanilla scrap and punched it out with the 2" Circle Punch. I punched a piece of Basic Black with the 2-3/8" Scallop Punch and then rotated the punched piece and punched it again with the same punch to get the spiky edges. Using a small sticky note helps align the already punched pieced. I adhered the spooky circle onto the spiky circle and then added this element to the card with Stampin' Dimensionals. That's it! Quick and easy! It took me longer to choose which two pieces of DSP to use than to put the whole card together!